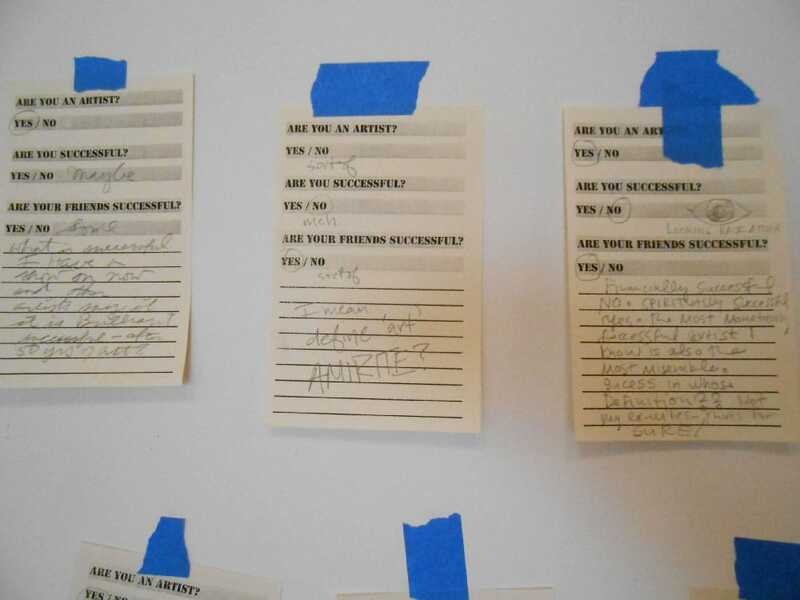 Momenta Art invited Occupy Museums (Occupy Wall Street) to use our resources to activate critical dialogue about the relationship between art and the market. More Here. 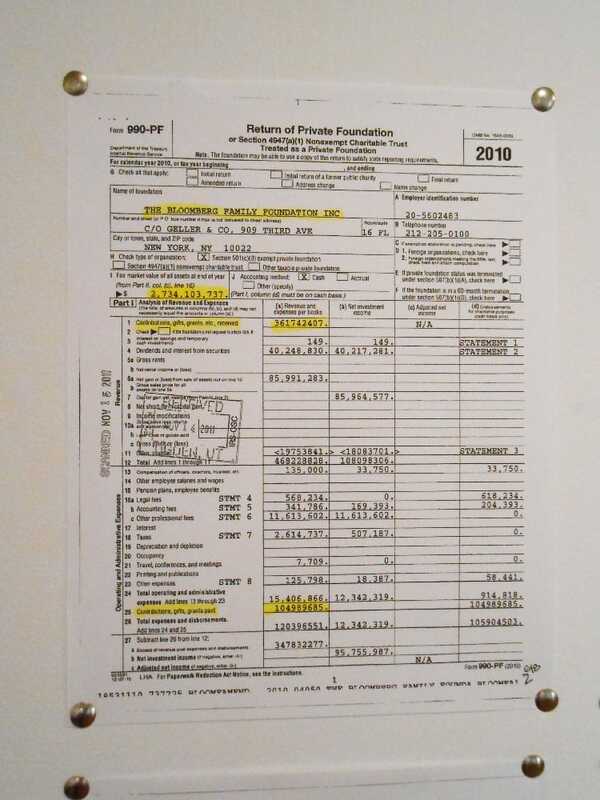 Michael Bloomberg Founded the Bloomberg Family Foundation (BFF) in Delaware -"The Tax Haven State" - in 2007, a year before his 3rd term as Mayor of New York. His $2,700,000,000 in tax deductible conrtibutions to this private foundation has drained our city of potential tax revenue, justifying cuts in city funding of homesless programs, education, and the arts. 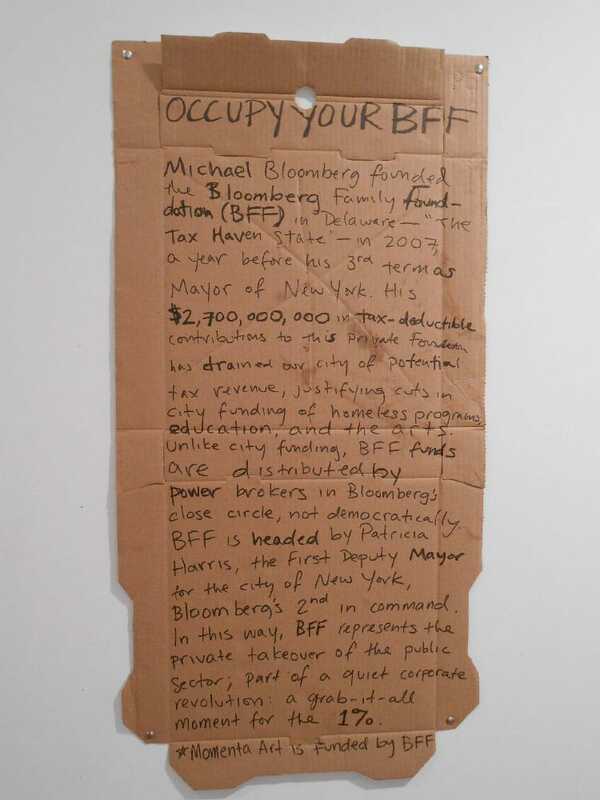 Unlike city funding, BFF funds are distributed by power brokers in Bloomberg's close circle, not democratically. BFF is headed by Patricia Harris, the First Deputy Mayor for the City of New York, Bloomberg's 2nd in command. In this way, BFF represents the private takeover of the public sector: a grab-it-all moment for the 1%. 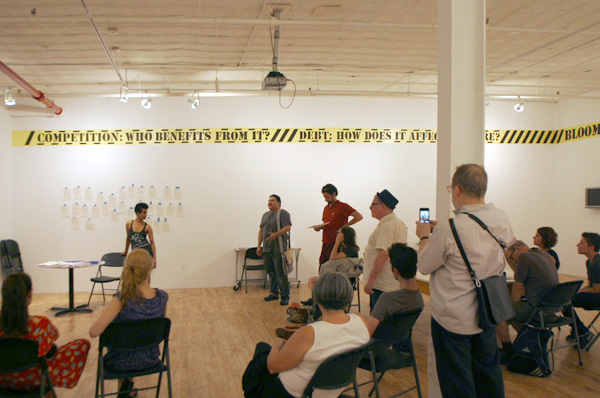 THE PHYSICAL SPACE OF MOMENTA ART IS A COMMONS FOR THE OCCUPY MOVEMENT (AND BEYOND) DURING THE SHOW. occupymuseums@gmail.com. This space is available from Thursday to Monday, 12pm to 6pm, but other times may be available upon request. With financial near-collapse and social unrest sweeping the globe, the destruction wrought by a generation of unchecked free-market ideology is now showing its face. So deeply has free-market mania infected our society that it is considered radical to imagine meaningful regulation on big business; impossible to imagine the system functioning contrary to the exclusive interests of the wealthiest. An ethos that celebrates the spectacle of money moving within the private sphere, while actively destabilizing the middle and lower classes, has come to define the institutions of our time. Museums and many individuals thoughtlessly comply, paving the way for the 1% to purchase our democracy, financialize art as luxury commodities, and further weaken the power of the 99%. Enough is enough. We believe that with our system as unbalanced and unsustainable as it is, change is inevitable. Join us at Momenta or visit www.nycga.net to get involved. In the last few years, reality TV’s Survivor-esque pop culture has connected with the art world.We are now seeing artists compete for attention and fan-love on television and art critics stepping into Paula Abdul’s shoes as cheerleaders. Withthe Brooklyn Museum’s recent “Go Brooklyn” call to artists, funded by Deutsche Bank, we are now seeing the mass-market social-network competition model applied to exhibitions. 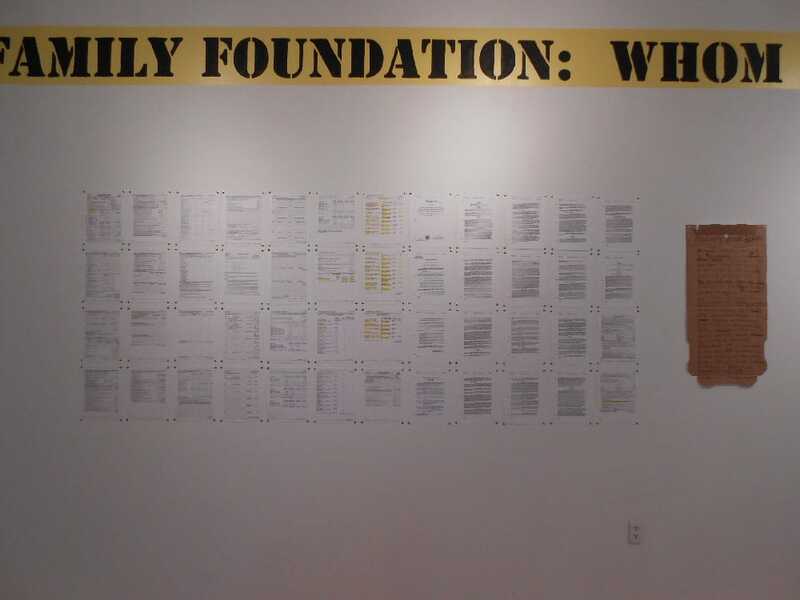 While it’s a populist gesture that may lead to more visibility for some artists, it takes on all the trappings of a pyramid scheme where the “dark matter” of struggling artists is capitalized for the benefit of a few winners, a museum, and a bank. Behind each winner, thousands upon thousands of artists struggle for visibility, climbing over each other while mired in student loan debt for an MFA that is now a must. 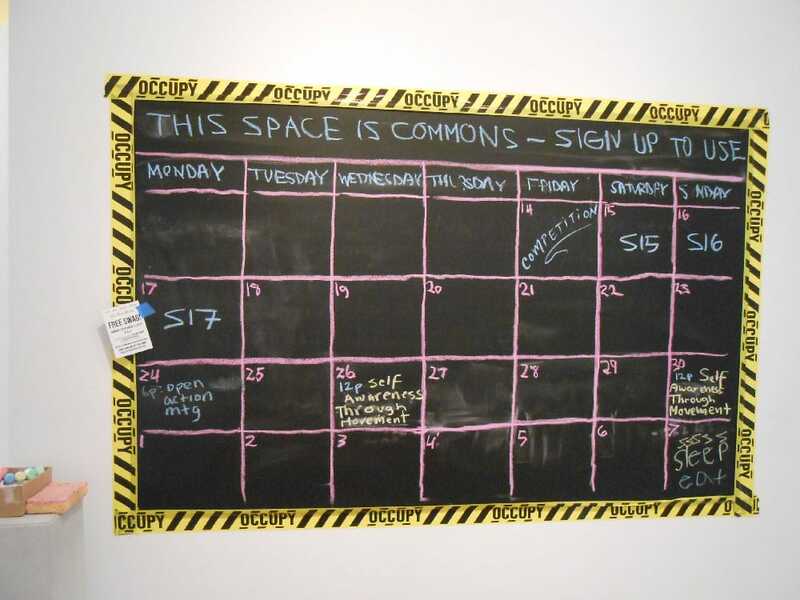 With unpaid internships, artworker precarity and constant creeping gentrification now common financial obstacles for artists, the deck is stacked against those without the privileges and connections to rise above the pack. Dare we imagine a model where 99% of culture makers are not pre-destined to lose? It is no longer considered radical or even hyperbolic to talk about debt as a form of slavery. As more and more people take on increasingly greater debt, social mobility decreases and people spend their entire lives paying off their houses, educations, medical bills, cars and everyday expenses. Entire governments are also now beholden to the private investors that finance them, a clear sign that the people no longer govern themselves. Debt fuels a culture of submission. Under the current rules of our Wall Street-driven society, taking on debt is not always much of a choice. In the cultural sphere, the now essential MFA pushes young artists into debt before their careers begin, many of whom will face an ongoing risk of default. Out-of-control student debt also pushes young doctors and lawyers toward the private sector’s high earning corporate jobs and away from lower-paid service to society. Draconian student debt laws mean that millions of Americans are likely to spend their lives hunted by collection agencies. This can end in despair: broken lives. Meanwhile Wall Street firms too deep in it get bailed out while the rest of us exist under a heavy weight or worse. So it’s time to ask some questions. What do we owe to ourselves? 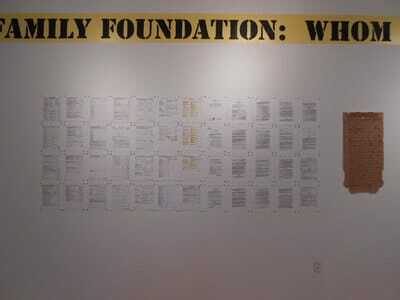 What do we owe to our children? What do we owe to our culture? Does our culture owe us anything? Art represents our cultural heritage, our common legacy. But the objects circulating in the global art market today have been stripped of this shared value and have become something sinister: markers of class hierarchy and easily manipulated comodities. Art objects are screened by auction-house connoisseurs and turned into “tangible assets” as they enter the secondary market, traded from vault to vault for huge sums. These commodities essentially become weapons of the 1%. Use of tax loopholes and sub-legal behavior lets the wealthiest acquire art to drastically reduce their taxes while hoarding these cultural spoils in the private sphere. The value of art has therefore tracked with the tastes, and under the command of the 1%- much like the infamous derivatives and credit default swaps; and such ‘products’ can also lose their value like those unloaded by Goldman Sachs. Museums, with missions to serve the public, have become tangled with the private financial interests of their board members who sometimes also sit on the boards of speculative auction houses, corrupting the notion of shared cultural value. 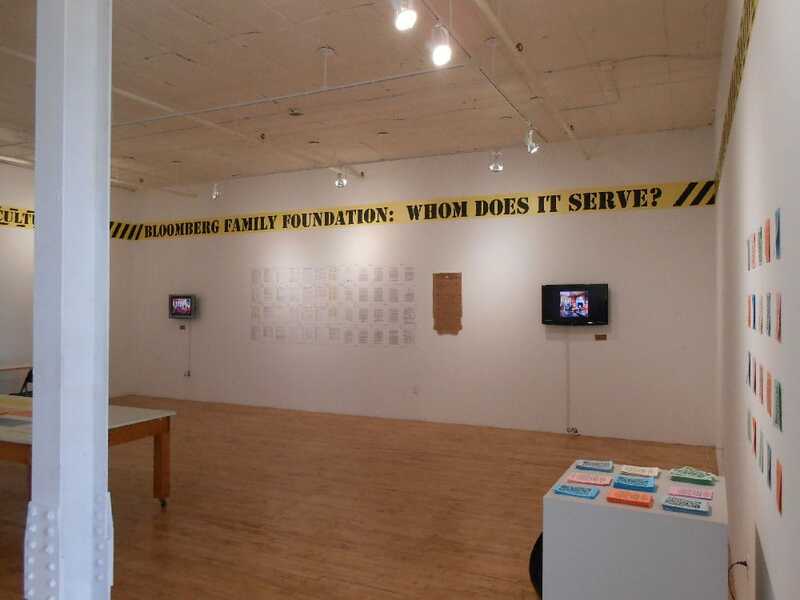 Art fairs, auction houses, and higher art education also contribute to this financialization of culture, which does nothing to benefit the vast majority of us. But how can we best value art apart from this model? Is the so-called free market always right or never right? Is it naive to think that art has value beyond money? How might this value system work? Michael Bloomberg is a figure whose hands are firmly on the levers of both public and private funding. The richest person in the city is also in charge of a three term political dynasty; with personal friends installed as major decision makers, his level of influence is historic. With major funding across the board given through his Bloomberg Family Foundation (BFF) as well as popular mayoral support of bike lanes and city greenery, many see this influence as benign. Yet dig a little and realize that Bloomberg is not a friend of the 99% and those of us struggling to cope with rising costs in the city. As Mayor, he has cut homeless programs in half, cut funding for education and recently cut funding for the arts. Bloomberg is the richest New Yorker yet he drains our city of tax revenue by funneling $2.3 billion in contributions to his foundation through offshore tax shelters; and the BFF funds are distributed by power brokers in his close circle, not democratically. Bloomberg is greasing the belts for the complete private takeover of the public sector; part of a quiet corporate revolution: a grab-it-all moment for the 1%. But what does “public” mean anyway and why fight for it? Is all philanthropy corrupt? Do we need a democratically-governed and public support structure? What can we do to get it back in a form that works here and now? Let’s get real. It can’t possibly be the case that the best system we can dream up makes a few winners and many losers, every time, though that is exactly what we see today. There are many people out there working for a society that cares for everyone. These are the brave pioneers, draining the swamps that dampen our imaginations and leading us to new futures. We can learn something from the achievements and mistakes of alternative institutions and we can bolster their efforts to push us forward. 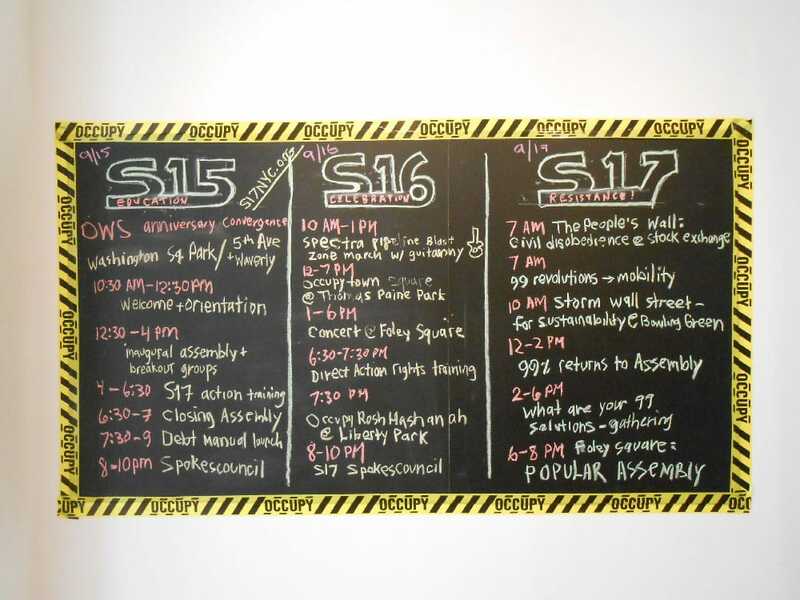 How can existing cultural institutions play a role in this positive shift? How do we want our culture to change? What can we do about it?